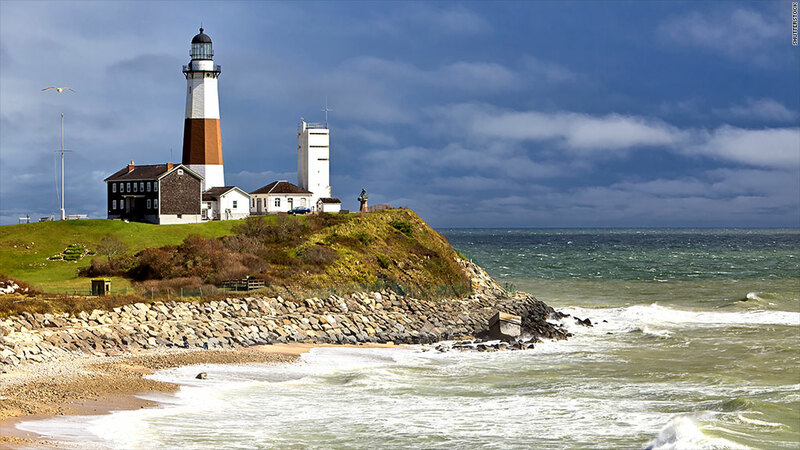 The Montauk Point Lighthouse in Montauk, N.Y. Federal prosecutors say the seaside town was home to a money-losing resort funded by a Ponzi scheme. Federal prosecutors announced charges Thursday against two New York men accused of operating a $96 million Ponzi scheme to fund a money-losing Long Island resort. An indictment unsealed Thursday alleges that Brian Callahan, a 43-year-old investment manager, perpetrated the fraud with assistance from his brother-in-law, 41-year-old Adam Manson. Both men pleaded not guilty Thursday and were released on bond. Between 2006 and 2012, Callahan allegedly raised more than $118 million from at least 40 investors, misappropriating roughly $96 million, the indictment says. Among the alleged victims was a Long Island fire department said to have contributed $600,000. Callahan is accused of diverting millions of dollars from investors to the Panoramic View, a 10-acre, 117-unit resort development in the seaside town of Montauk that prosecutors say has proven unprofitable. Callahan allegedly acquired the property along with Manson in early 2007. Callahan also allegedly used investor funds for credit-card bills, luxury cars including a BMW and a Range Rover, and down payments on lavish homes in Old Westbury and Westhampton, N.Y.
Manson, who managed the Panoramic View property, is accused of aiding the fraud by lying to an auditor and helping Callahan produce fake financial documents. Loretta Lynch, the U.S. Attorney in Brooklyn, said the men "used one of Long Island's landmarks, the Panoramic View Resort, to perpetrate a wide-ranging fraud." "Callahan gave his word that he would invest his clients' funds safely and responsibly in established vehicles," Lynch said. "To conceal their status as business failures, the defendants employed all the tricks in the typical con man's bag." The Securities and Exchange Commission charged Callahan and Manson last year in a case delayed pending the outcome of the criminal matter. The SEC obtained a court order at the time freezing the assets of Callahan and his firms. Robert Anello, a lawyer for Manson, said the case "has no basis as it relates to Adam, who has done nothing except act in an expert manner in dealing with the Panoramic properties." A lawyer for Callahan did not immediately respond to requests for comment. Panoramic View declined to make a representative available for comment.